Fill in your details below and we will let you know within 24 hours if we can get Adventure Time Card Wars: Finn vs. Jake to you with haste! Adventure Time Card Wars is the most epic card game ever found in the Land of Ooo, or anywhere for that matter! In the Adventure Time episode "Card Wars", Jake begs Finn to play his favorite trading card game. Finn accepts, despite warnings from Beemo on how very competitive Jake can be while playing the game. Finn and Jake battle against each other to decide who will be the Dweeb and who will be the Cool Guy. 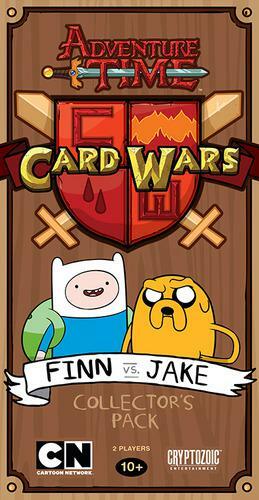 Now fans can play the actual Card Wars game in Adventure Time Card Wars: Finn vs. Jake, with all of the action taking place in four combat lanes. Jake's corn-themed deck features creatures from the episode such as the powerful Husker Knights, the intimidating Legion of Earlings, the heroic Archer Dan and many more! Finn's "Blue Plains" deck features creatures from the episode such as the wise Ancient Scholar, the aptly named Cool Dog, and the most fearsome critter of all – The Pig!